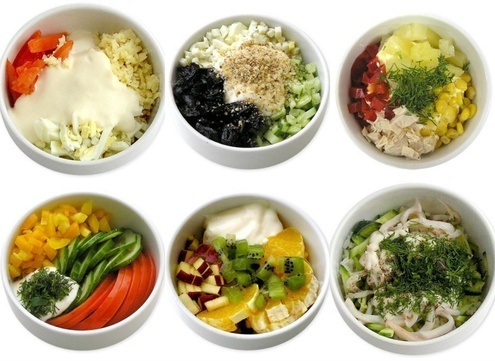 Zemmrate » Masterclass » Quickly and easily - 7 variants mini salads. Spring maximalism. Light salads "in haste"
To cook small portions of salads "in haste" does not need to have special wisdom. Enough to have a small supply of refrigerated products and a little time. However, for some recipes need to purchase ingredients in advance. 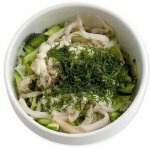 Recipes mini salads that we want to offer you - very useful and tasty. They combine fresh fruit, vegetables, herbs, which is very necessary in the spring to replenish vitamins and their small portions will not allow you to overeat and gain weight. Cut the tomatoes into two equal halves, gently remove the inner part and place in a separate bowl. Put slices on a platter. 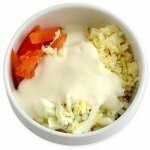 Grate the cheese grater, mix the contents in a bowl and add the herbs, spices, mayonnaise. If you love salads witty, then you can add 2-3 minced garlic head. Decorate mini corn marinated salads, and, behold, the salad is ready. 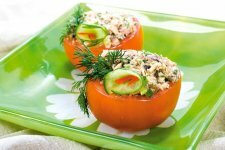 Salad "Tomatoes" is perfect for a snack to alcohol. 2. Mini salad "Fresh fruktiki"
This salad everyone can do "by eye", selecting certain fruits of their own number, depending on taste preferences. For example, you can mix the chopped apples with oranges, kiwi, banana and fill all yogurt or ice cream. With such a salad, you can experiment a lot, each time changing the ingredients and dressing. 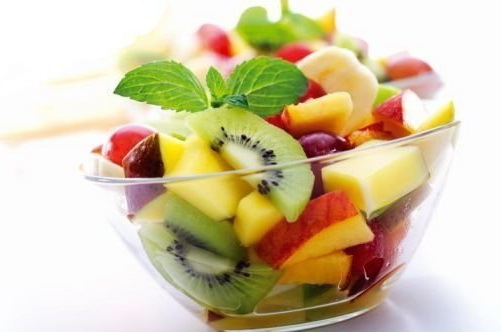 Fruit mini salad can be a great energy breakfast or snack. 3 . 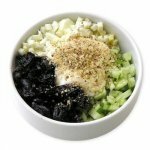 Mini salad "Edelweiss"
- 2 tsp. 3% of vinegar. And so, diced tomatoes and chicken flesh, combine with grated cheese, corn and cole greens. In olive oil, add the mustard, vinegar and mix thoroughly. Next, cut the peppers lengthwise into two parts. Cooked lettuce put in pepper halves, sprinkle croutons made ​​from white bread, toasted in butter with garlic. And in the end all decorate with greenery. Salad "Tenderness" with chicken and prunes reputed easy and nutritious dish that is perfect for options: romantic or family - it does not matter. Pre- soak prunes in hot water. When prunes become soft, cut it into strips. Hard-boiled eggs and separate the whites from the yolks. 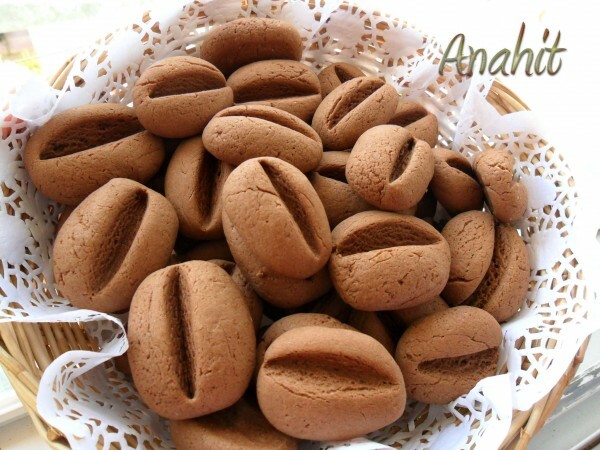 Walnuts cut into small pieces with a knife. Cucumber peel and cut into strips. Edges can cut cucumbers, which can be bitter. Pulp is also cut chicken into strips. When you prepare all the ingredients they need to spread layers. Best to take the bowl with a flat bottom. Layers spread in the following order: chicken prunes, cucumbers, proteins, nuts, egg yolks. Each layer need promazyvat mayonnaise, except for the last layer yolks. The upper layer of salad greens beautifully arrange a try. * To make the salad turned out tender, cut the ingredients as finely as possible. First boil the chicken, then cool it and cut into cubes. Take pepper red, wash, peel and cut into cubes. Try to take equal amounts of all ingredients. Diced cut tomatoes, pineapple. 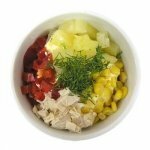 Put in a bowl of corn, pineapple, pepper, chicken, apple. Add dill and mayonnaise. Cut the cucumbers and tomatoes into small pieces, onion - half rings, salad pepper - julienne. Mix with chopped herbs and add salt to taste. Season the salad with vegetable oil and mix. Prepare a salad just before serving and eating. 7. Mini salad " Devine"
- mayonnaise, salt and pepper. Clean the squid, dip them in boiling water and cook for two to three minutes. Ready squid cut into thin strips. Onion cut into half rings and pour boiling water for a few minutes to remove the bitterness. Then rinse the onion in cold water. Cut strips boiled eggs and cucumbers. Lettuce is not necessary to cut , break them into small pieces and put her hands in a bowl. 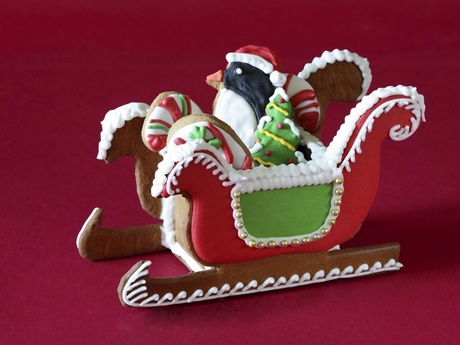 There also add all the prepared ingredients, salt, pepper and season with mayonnaise. 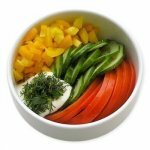 These are simple and quick recipes mini salads, you can try to cook today.